The tiny Aleutian village of Akutan, perched precariously under Akutan volcano, hosts one of the most important data telemetry sites in the entire Plate Boundary Observatory (PBO) network. 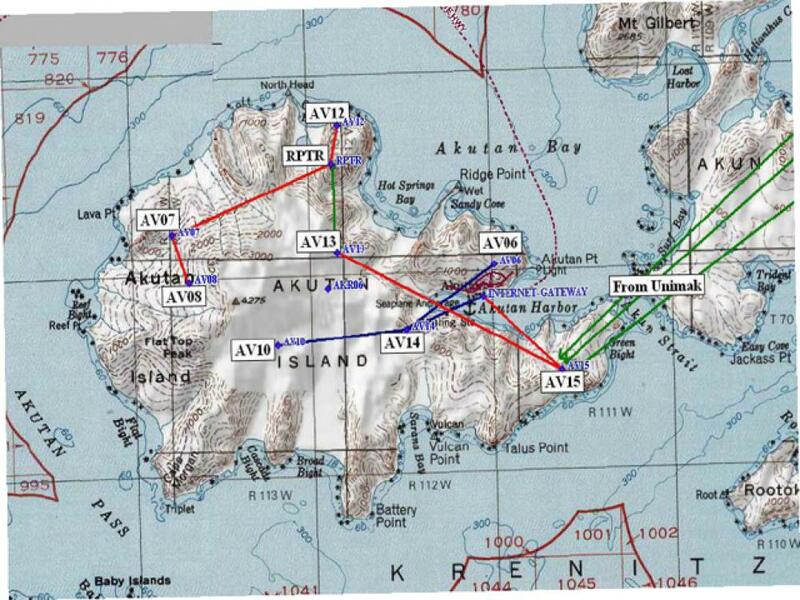 Data from 18 stations ( four GPS stations/two tiltmeters on Unimak Island and eight GPS stations/four tiltmeters on Akutan ) converge in this village where they are uploaded through the Internet to the PBO Archive in Boulder. 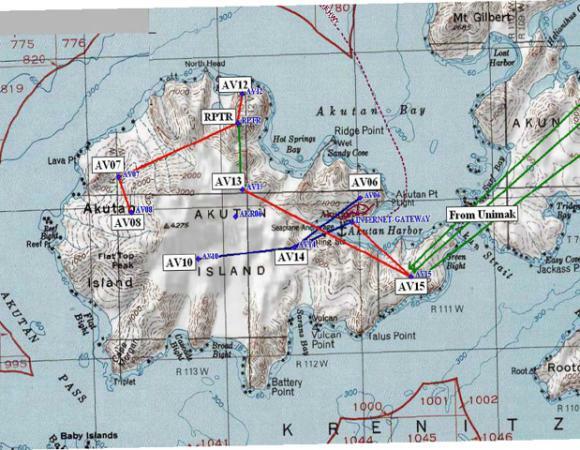 When the Akutan data communications network was first built in 2005, PBO relied on a WISP (flxed wireless) for the Internet gateway. This turned out to be an unreliable solution with intermittent failures. The system was replaced with a VSAT data communications. The VSAT solution, while much more reliable than the WISP, has occasionally gone off-line during the last four years of operation. 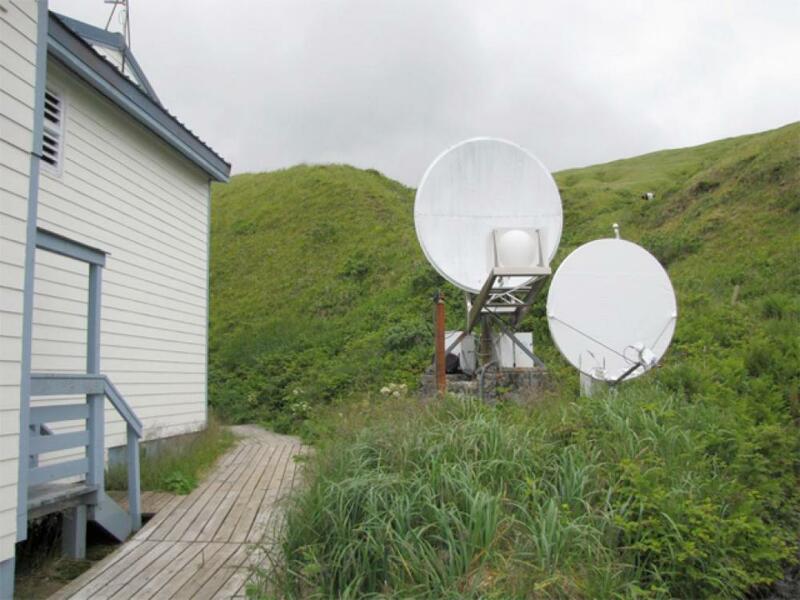 The high winds common on Akutan, which can gust to 100 mph or more, have caused some movement of the VSAT dish which eventually caused a loss of connection to the satellite. During the winter of 2008 - 2009, the VSAT system lost its link. PBO was finally able to trace the source of the WISP failures and to get it back online as our primary gateway. Even though the WISP continued to work well through the spring, PBO decided to revive the VSAT link and setup a redundant connection to the Internet. During the maintenance work this summer, PBO field engineers set up the infrastructure for the redundant data communications links in the village. PBO engineers relocated the radio gateways and antenna to consolidate the data communications equipment . They also installed a router with the capability to manage IP traffic over the two independent Internet gateways, WISP and VSAT. The VSAT gateway will eventually be designated as the primary link and all IP traffic will be preferentially routed through this connection. If the primary link should fail, then the router will sense that and change the routing of Internet traffic to utilize the secondary link. Unfortunately, it was not possible to complete the work during the summer visit because additional parts to repair the VSAT were needed. In the first week of December, PBO Field Engineers returned to carry out the final stage of this work. They returned to Akutan with a full set of spares for the VSAT but were unable to reestablish the satellite connection. Further efforts were ended by a severe winter storm, with gusts over 100 mph, that blew through while a PBO crew was working on the Island. All flights out of Akutan Village were cancelled. Luckily, they were able to hitch a ride back to Dutch Harbor on a freighter that had stopped to seek shelter from the storm. The 200 ft freighter had no problem navigating to Dutch Harbor despite the 50 ft seas and 100 mph winds that remained in the storm’s wake. Three days after their safe return to Dutch Harbor, the PBO field engineers were able to get on a flight back to Anchorage. PBO will return to install a new VSAT during the next maintenance visit, scheduled in the spring 2010. In the meantime, the WISP has so far survived the winter storms and continues to provide a reliable gateway for data flow from the Akutan and Unimak stations.